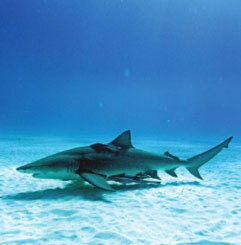 Bimini marinas protect the shark population; Immigration policies are clarified. Three marinas on Bimini have joined the international Shark- Free Marina Initiative in an effort to aid conservation of shark species threatened by overfishing. Registered Shark- Free Marinas participate in a voluntary program under which they agree to prohibit sharks from being landed at their facility. The Initiative’s mission is to work with local businesses and fishermen to develop realistic goals, however; catching a non-endangered shark is not prohibited, but member marinas encourage anglers to practice catch-and-release techniques. We’ve seen reports on Bahamas cruisers’ nets of confusion among some non-native cruisers over appying for an extension to their stay in the Bahamas. As we discussed last month, the stated policy of the Bahamas Immigration Department is that all citizens from the United States, Canada and United Kingdom are “landed at all ports for 30 days”. If you want more time, you can request an extension, which may be approved following an interview with an Immigration officer. Southern Boating recently spoke with Brent Symonette, Bahamas Deputy Prime Minister and Minister of Foreign Affairs, who confirmed this policy. “If you want to stay longer than 30 days, the officer has the authority to give it to you, if he thinks it’s warranted,” Brent said. locations with both a Customs Officer and an Immigration Officer; for example, Nassau, Bimini, Chub Cay, West End, Port Lucaya, and Marsh Harbour. Take great care to fill out ALL the forms with accuracy and completeness. An error can affect the length of stay given or cause you to return to the office the next day. A neat and presentable appearance is important. Officers will be looking to limit the stay of those who appear to be a security threat as well as those who may be seeking to take the jobs of Bahamians. Whatever time period you are granted initially, you can always visit the Bahamas Immigration’s head office in Nassau to have it extended, without waiting until the last week of your initial time period to apply at another port of entry. Currently, the working phone numbers for Immigration in Nassau are 242-322-8504 or 242-322-7530; Nassau Immigration Dock is 242-323-3330; Nassau Immigration, Airport is 242-377-7032. Long Island—At Salt Pond, the waterfront resort Long Island Breeze has added a new rental cottage as well as a sturdier floating dinghy dock for its patrons. The resort’s main restaurant is open for the winter season; the Patio Bar & Grill is open year-round. Contact 954-646-0364 or visit longislandbreezeresort.com. Bimini—The entrance channel at North Bimini is shallower than charted on Chart BIM 3, p. 54 of Explorer Chartbook Near Bahamas, 5th edition. A January 3, 2011, survey by the Explorer Team found the controlling depth to be 1.7 meters (5 2/3 feet) in the area of 25° 42.70’ N, 79° 18.25’ W. There was a little deeper water east of the dashed track. The sandbar west of this position has encroached on the entrance channel. Two larger buoys (red and green) are easily seen from well offshore, plus one smaller green buoy closer in to shore. The large red buoy is almost directly on the Explorer waypoint, so caution should be taken on approach. Channel buoys here are unreliable as the sand is fluid and storms may take them out. George Town, Great Exuma—There has been a buoy missing off Sand Dollar Beach in Elizabeth Harbour at 23°30.41N, 075°44.70W since December 23, 2010. It will be replaced when weather allows. For a monthly update on current fuel and dockage prices in the Bahamas, check explorercharts.com. Once you’re on the website, you’ll notice that the 5th edition of the Explorer Chartbook Far Bahamas (including 12 new pages on the Turks and Caicos) is now available.